The term anterior commissure refers to a bundle of nerve fibers that cross the midline of the brain dorsally in the anterior hypothalamic region, ventral to the septal nuclei, and caudal to the median preoptic nucleus and nucleus of the anterior commissure; it's caudal aspect protrudes into the third ventricle. Identified by topology, it is one of three bundles referred to as forebrain commissures. It is composed of two parts: the olfactory limb of the anterior commissure and the posterior limb of the anterior commissure ( Carpenter-1983 ). Some authors distinguish a third component, the basal telencephalic commissure ( Lamantia-1990 ). It is found in the human ( Carpenter-1983 ), the macaque ( Martin-2000 ), the rat ( Swanson-2004 ) and the mouse ( Hof-2000 ). 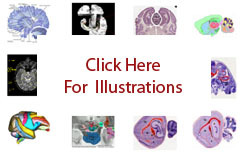 It provides a prominent landmark for ventriculography and MRI. Thus, a point on or within the anterior commissure at the midline is commonly designated the zero point of stereotaxic space in brain atlases, including Talairach-1988 for the human, Martin-2000 for the macaque, and Bowden-2011 for the mouse.